One of Don Carlos Andrade's most popular blade profiles, this stunning one-of-a-kind kiritsuke chef knife features a 1095 carbon blade with a rainbow quench that mesmerizes the eyes and invites you in for a closer look. 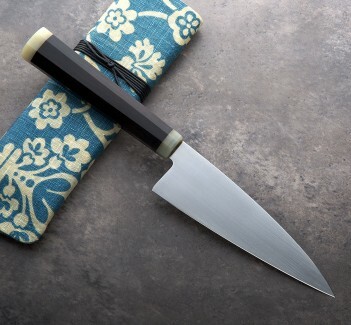 At 150mm, the thin, light blade is fast and versatile in the kitchen, exceedingly comfortable in a pinch grip and just tall enough at 43mm for the lighter chopping tasks. 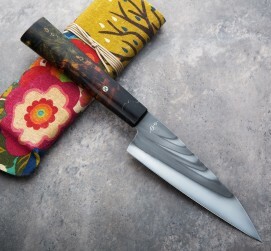 The etched and polished blade is matched to a beautiful piece of stabilized buckeye burl with a single mosaic pin. A cloth-covered protective case is included. 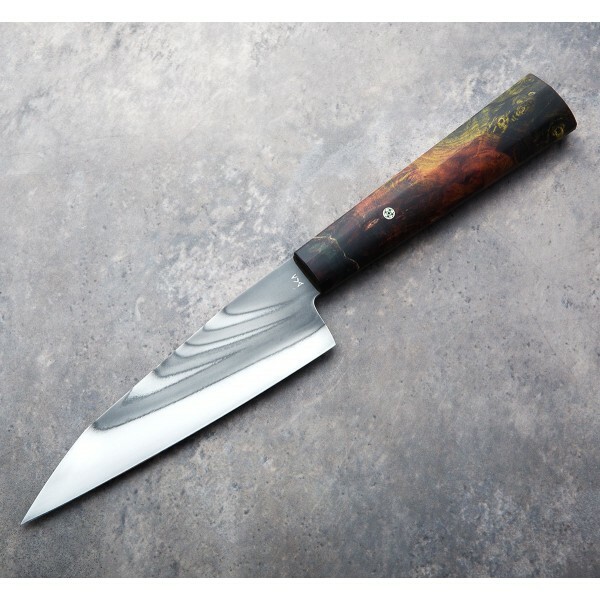 The out-of-this-world rainbow quench lines in this blade are a wonderful representation of Don's ability to morph form with function, using a his precise heat treatment and tempering process to create a piece of functional art. 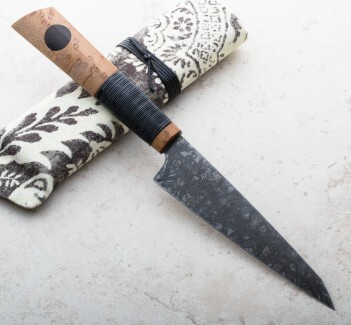 As an artist, sculptor and blacksmith, Don often experiments with new ways of creating man's oldest tool, building unique and purpose-driven chef knives inspired by the years he spent working in kitchens. 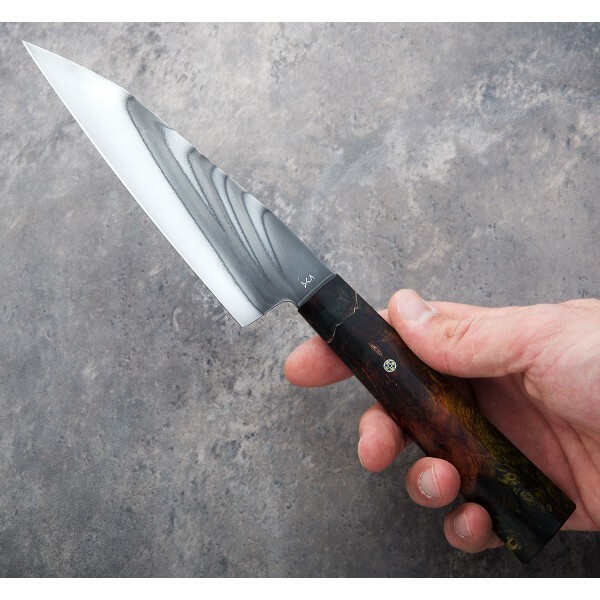 Building each knife by hand at his one-man shop in Los Osos, California, Don has been building knives for professional and home cooks alike for over a decade and represents the best of western bladesmiths. 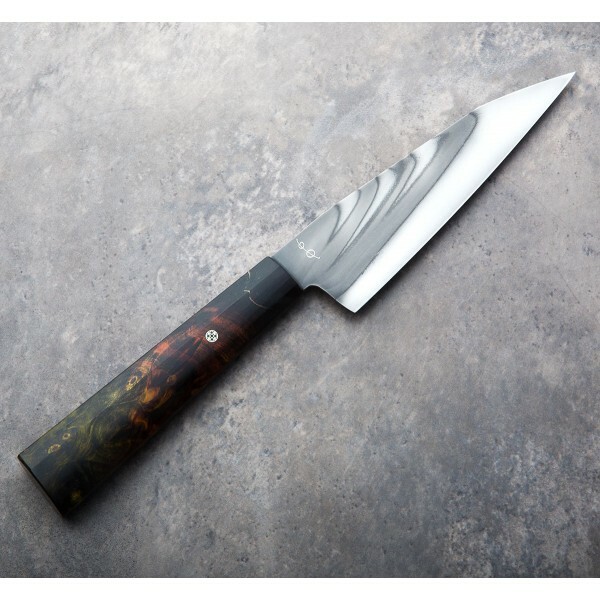 Blade length: 150mm / 5.9". Overall length: 298mm / 11.75". Blade width at choil: 2.8mm. Blade wiidth 1" from tip: 1.4mm. Blade height at heel: 43mm. Weight: 4.6oz / 132g. 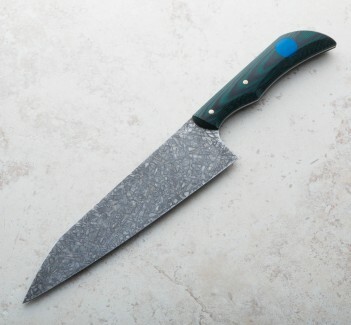 Blade: 1095 carbon steel with rainbow quench, etched and polished. Handle: Dyed and stabilized buckeye burl.